This was awarded by the Swedish Minischnauzer Club on February 17! INT DogShow in Växjö 2018-11-02. 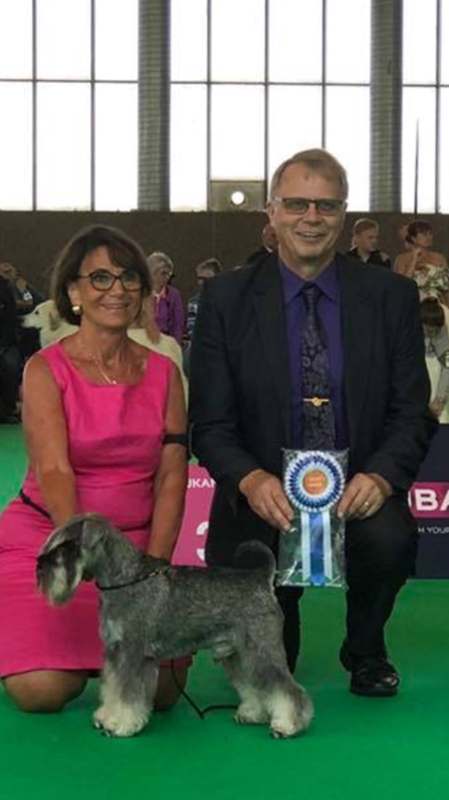 INT & NORD CH & NORD W-15 SCHNAUZI-HEROS KUNG KENZO was BOS with CACIB. 25 entries for judge: Lars Widen. We also say congrats to ARGENTAS MINI JAEGER who was 2: nd BEST MALE with CAC and res-CACIB and new SE CHAMPION. Jaeger is a son of our Little Star TRUFAS NEGRAS, alias Messi. Kenzo winning the Special DogShow in AMSTERDAM in August 2018. Judge: Bo Skalin.